It has long been recognized that there are patterns in the causes of death for our dogs. Younger dogs die from different things than older dogs, and different breeds have greater or lesser risk of dying from different causes. Understanding these patterns is helpful in many ways. It helps owners know what sort of problems to watch out for in their pets. It helps veterinarians focus on the most likely cause of a particular dog’s illness. And most importantly it guides us in identifying specific risks for individual patients and taking action to minimize these and prevent or delay illness and death. Causes of death also change over time, and they are influenced by how we care for our pets. Nutrition, vaccination, neutering, confining pets rather than letting them roam, and many other factors under our control influence the causes of mortality in our pets. But the relationship between these things and what our pets die from isn’t always what we think it is. There is a lot of mythology and misconception out there about the risks our pets face, and it requires careful, objective, and laborious research to identify the true mortality patterns that will then let us identify the best ways to reduce these risks. A new study from the University of Georgia makes a major contribution to our understanding of the causes of mortality in different breeds of dog. Fleming JM, Creevy KE, Promislow DE. Mortality in north american dogs from 1984 to 2004: an investigation into age-, size-, and breed-related causes of death. 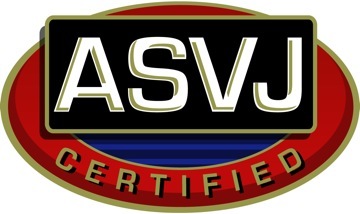 J Vet Intern Med. 2011 Mar;25(2):187-98. This study involved sifting through 20 years of records from the Veterinary Medical Database, a collaborative resource that includes records from 27 North American veterinary medical school teaching hospitals. Causes of death for over 75,000 dogs in this database were identified of the relationships between cause of death, age at death, and breed were analyzed. The results are occasionally surprising, or fill in gaps where no previous data were available, but they also often confirm recognized patterns long established for humans and previously demonstrated or expected for our dogs. Causes of death were categorized in two ways: by the organ system involved, and by the category of disease (called the “pathophysiological process”). This allowed the investigators to identify both what specific organs in the body were most often involved in fatal disease for individuals of each breed and also what kind of disease led to death. The figure below shows the percentage of dogs in the study whose deaths could be attributed to specific kinds of disease of disease in particular organs, both for juvenile animals (less than 1 year old at death) and adults (over 1 year old at death). Figure 1. Proportion of deaths attributable to each organ system (OS) and pathophysiologic process (PP) category for juvenile (up to 1 year, A and B) and adult (1 year or greater, C and D) dogs. Among 9,859 juvenile dogs, 2,792 were unclassified for OS (A, n = 7,067) and 3,004 were unclassified for PP (B, n = 6,855). Among 64,697 adult dogs, 12,374 individuals were unclassified for OS (C, n = 52,323) and 23,438 individuals were unclassified for PP (D, n = 41,259). Overall, this shows that the organ systems in which fatal disease arises are remarkably similar for young and old dogs. And the relative contribution of particular organ systems to mortality is fairly even, though the gastrointestinal, nervous, and musculoskeletal systems tend to be involved more often, and the skin, eyes, liver, and glandular systems are less commonly involved. The figure also illustrates that the causes of death are quite different for dogs of different ages. Young dogs are overwhelming likely to die of infection, trauma, or congenital disease, whereas cancer (neoplasia) is by far the greatest cause of death in older dogs. The other figure that I think most effectively illustrates the findings of this study, shows the frequency of particular causes of death at different ages. This contains, in some ways, the same information as the chart above, but it helps to clarify quite nicely what I believe is a key pattern. Figure 3. 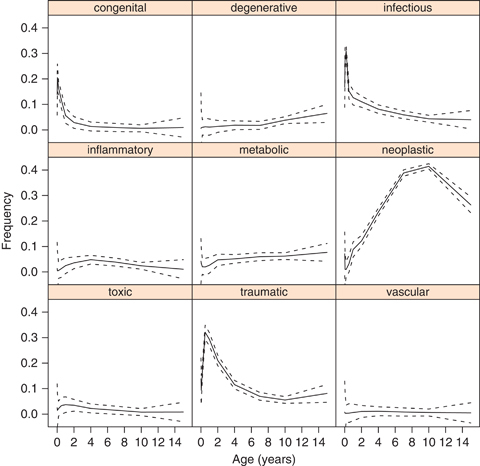 Relative frequency of causes of death by pathophysiologic process (PP), as a function of age (years) for all breeds with more than 100 representatives (n = 46,720, excluding 25,656 individuals unclassified for PP)… Estimates are provided for each of 10 age-classes, with points connected by a solid line to highlight any obvious age-related trends. Dashed lines represent 95% confidence intervals. Again, clearly death from infection, trauma, and congenital diseases are by far the most common before about 2 years of age, and the risk of cancer rises steadily with age until it peaks at about 10 years, Interestingly, the cancer risk overall then drops after this age, though it is still the most common cause of death. The paper also contains a lot of information about the most common causes of death for many individual breeds, which it would be cumbersome to reproduce here. Some patterns are familiar to many veterinarians, such as the relatively higher incidence of cancer deaths in Boxers and Golden retrievers than in many other breeds, and the high frequency with which small breed dogs suffer from neurologic and cardiac disease. However, other patterns have not previously been identified in scientific research, such as the high rate of cancer deaths in Bouvier de Flandres dogs and the relatively high rate of cardiovascular causes of death in Fox Terriers. More detailed and specific research will be required to sort out the causes, and possible treatment or preventative interventions, involved in these breed-specific patterns. However, this study gives us many new and potentially useful targets for such further investigation. So what sort of useful conclusions can we draw from these data? Well, we can say, for example, that cancer is a disease associated with aging, and it is far more common in older dogs than in younger dogs. And, despite the claims sometimes made that it is due to chronic exposure to toxins in commercial dog food, vaccination, and so on, the fact is that the incidence of cancer increases with age in all breeds regardless of differences in lifestyle, and that it also becomes less common in the oldest individuals. If it were simply a matter of the risk going up the longer dogs were exposed to such purported environmental toxins, then the risk should continue to rise steadily with age. However, it is well established in humans that there are genetic predispositions to cancer as well as age-associated increases in risk, and that those individuals who survive to extreme old age are relatively less likely to get cancer since they appear to have protective genetic constitutions. The variation in cancer risk by breed and the age-associated patterns seen in this study show a similar pattern. In short, cancer occurs largely as a result of the interaction between genetic risk factors and age, with lesser contributions from environmental influences that also interact with genetic factors. Cancer is what you die of if you’ve avoided dying of infectious disease and trauma and lived long enough to get it. The relative increase in cancer as a cause of death in our dogs over the last few decades is a sign of our success in reducing the importance of these other causes, not a damning indictment of our toxic environment or nutritional and vaccination practices. There are, of course a number of limitations and caveats to the data in this study and the conclusions we draw from them. Perhaps the greatest of these is that the dogs studied were individuals seen at veterinary teaching hospitals. These hospitals typically see the sickest patients and the most complex or unusual cases, since less severe or common problems are often taken care of by private practice veterinarians. And some research suggests that many dog owners do not routinely seek veterinary care at all, much less the high-level care offered at a teaching hospital. So the study population may not be representative of the overall dog population, and the particular causes of death may not accurately reflect those of all dogs, even if the general patterns are the same. If, for example, dogs not seen at teaching hospitals are less likely to have recommended vaccinations or other preventative care, or are less likely to be taken to a vet if injured, then the relative contribution of infection and trauma as causes of death may be higher in the general population than in the dogs in this study. And the information in this report doesn’t specifically tell us how common specific causes of death are in particular breeds or particular ages, that is the absolute frequency of these causes. To figure that out, we’d need to know something about all the dogs of each breed at each age who didn’t die. The data can only tell us the relative frequency of different causes in each breed. And we can’t yet know about changes in these risks over time, or about regional differences, though the authors are apparently continue to analyze the data to find some of those answers. It will be interesting and useful to see what trends are identified over time in these data. I would expect, for example, that the relative importance of infectious disease as a cause of death would decrease over time as prevention and treatment improve and are utilized by more pet owners. But only time and the hard work of these researchers will tell. Still, this is an important study which adds significantly to our understanding of the causes of death in our canine companions and which will help guide future efforts to understand these causes and reduce or eliminate those risks we can. The link provided in this article does not go to the abstract of the Ga study. Can you please provide correct link? Thanks. The link to Pubmed seems to work intermittantly, so I replaced it with a link to the journal site. Thanks. Very interesting article! I think you’re right though about the fact that data may be skewed because the stats were taken from teaching hospitals! I have ALWAY thought that the “hybrid vigor” claim statistics were skewed because so many rural dogs are NEVER seen by a vet. Only “house dogs” and purebred dogs are usually taken to the vet. so the numbers have ALWAYS been skewed. Who studies rural farm dogs’ causes of death? I’m not aware of any formal studies of causes of mortality in rural dogs per se. In this study, the category “Mixed-breed” was actually the largest group of dogs, so I do think the issue of hybrids is accounted for. I work at an urban practice in a pretty affluent area, and a large percentage of my patients, possibly a majority though I don’t have numbers to say for certain, are mixed breeds adopted from shelters, so I do think a fair number of crossbreeds do get veterinary care, though I agree this is more true of animals intended as companions than of “backyard” or roaming dogs. Interesting article, it’s nice to see so many more studies with robust numbers being done in veterinary medicine. I appreciate the analysis as well. On a totally unrelated note, I feel it is important that people in the veterinary community start using the word data in a grammatically correct way. The word data is the plural of datum, therefor the correct phrase is “data are” not “data is”. I see this mistake frequently in veterinary publications, which is problematic when those publications are expected to be taken seriously by the scientific community as a whole. Thanks for posting this, it is great information. Regarding the skew from the data being taken from university vet hospitals, I think that might account for some of the drop off in neoplasia as cause of death after the age of 10. I find that the older a patient is, the less likely the owners are to pursue referral if neoplasia is diagnosed or highly suspect. Regarding Ms. Bobinski’s comment: In this article I didn’t see any segregation of data for purebred vs mixed breed..but glad that you cleared that issue up. I don’t know why there is such a resistance to the idea of heterosis! It’s a well-documented scientific phenomenon. Maybe the earth is flat too? LOL. My outcrossed pups are indisputably much more vigorous than those who have been line- or inbred. Good point. It’s hard to know for sure, of course, without data on the population that does not seek referral. But the trend is consistent with that seen in humans in which cancer incidence peaks at about age 80 and then decreases after that. So the pattern may be the result of bias or it may reflect the inherent biology of cancer. I agree and am embarrased to see that I did not consistently treat data as plural. Thanks for pointing that out! Nice write up and discussion. It does raise some questions in my mind, though. What does death in this study mean? Certainly an animal that dies without euthanasia can be analyzed. But if a dog has a slow growing neoplasia but is euthanized for severe arthritis, what category does he fall into? Or, conversely, if he is euthanized for a treatable but expensive neoplasia, where does he fit into this picture? Thanks for bringing up a very improtant issue. Hardly any of our patients die of their disease. They die when their owners feel they are suffering too much, when their owners run out of money to treat, and so on. Presumably, it is reasonable to say they died of the disease that led to their euthanasia either way, but of course there will be cases such as you describe in which the “real” cause of death isn’t clear. And this distinction is especially meaningful when one considers different populations of owners with different values, resources, etc. Given that the study included tens of thousands of dogs over a twenty-year timeframe, hopefully the number of clear-cut cases outnumber the more ambiguous ones enough that the number sare ultimately still meaningful, but it is hard to be certain. “Cancer is what you die of if you’ve avoided dying of infectious disease and trauma and lived long enough to get it.” Cancer is therefore “not a damning indictment of our toxic environment or nutritional and vaccination practices.” Exactly right. Living creatures age and die, and to do so they must ultimately die for some reason or reasons. Eventually these reasons escape further attempts at treatment. Rationales for unproven, and so-called “alternative and complementary” methods, when what their protagonists call “conventional” therapy completes its usefulness in end stage disease or end-of-life processes, are often mere fantasy. Thanks for this useful summary. As a volunteer in Rescue, I do think it’s important to note that teaching hospital stats would not include shelter euthanasia, which I will guess is still by far the leading “cause” of canine death. I realize that’s a different kettle of canines, as well, with many of its own implications and takeaways. My spayed Westie Ziggy 14.6 years was diagnosed with diabetes a year ago (Aug 2012). We have given insulin twice per day with her food. Now she has been coughing and has been diagnosed with lymphoma. I was reading how cancer can be from pesticides. We took her walking at Stone Mountain Park in ATL GA one the railroad tracks this spring. I was thinking maybe she got pesticide from the tracks. Or from the Orkin Home Pest spray we use to control roaches and mole crickets. This article helps me feel a little better that I wasn’t careless in managing to keep her from pesticides. Cindy, I think you can feel safe in the knowledge that taking your Westie on the RR tracks this spring did not cause the lymphoma. It is more likely that age and a predisposition factored in (having diabetes as a primary health issue didn’t help but through no fault of hers or your own, mind you). Many cancers are slow growing and sometimes are not detected until much later on either through an annual check-up/blood work and other diagnostics, or due to symptoms manifesting and thus the owner takes the pet to the vet. Likewise, although I’m not a toxicologist, I don’t think cancers develop that quickly as it pertains to yard/garden/home uses of products – yet accumulation by frequent or prolonged exposure is not helpful in the long term. I sincerely hope you and your vet can work together to determine a treatment strategy for your little girl, here’s wishing you much luck! I think that death from cancer decline after 10 years for dogs (and 80 years for humans) simply because other causes of death take over. According to my knowledge of data analyses, the data shown do not allow (not in any way) to comment about the influence of pesticides, vaccination, food, … on cancer. To do so, we would need a population expose to these, and a population not exposed to these (and yet similar in every other ways). Then, if there were a change in the incidence of cancer on those tow groups, that would justify… not a definitive conclusion, but suspicion, and further analyses. I have spent the last 9 days feeling such a tremendous amount of guilt after abruptly losing my beloved pit bull, Hemi, to a large tumor on the spleen. He was a little over 10 years old and completely asymptomatic until the last 8 hours. At that point, it was clear from his rapidly deteriorating condition and from the shocking abdominal film that the most compassionate thing to do was euthanasia. Even so, this was extremely difficult. It just didn’t seem possible for the tumor to be so advanced and yet his preceding state of health to seem so outstanding. Your article helps me understand that his case was not unusual and that I am actually fortunate to have had so many years with him in vigorous health. I only wish I had read this earlier so that his death would not have come as such a shock. I miss him every single minute. Thank you for sharing this important information. My condolences for your loss. I have always taken some comfort in trying to remember that while it is emotionally harder for us when we lose our companions suddenly and unexpectedly, it is at least better for them that a prolonged. I hope you have many joyful memories of your friend to cherish. I admire the research done here – it may not be the most scientific, however it does provide some decent direction for others to follow-up on. I would love to see someone develop a useful site with an ability for all appropriate “inputees”(? not sure of the correct term – begging mercy from the grammar police!) 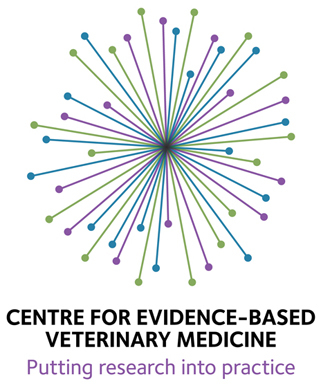 which includes Vets, Vet Hospitals, Animal Welfare and Shelter groups et al to post reliable data the could be analysed on an ongoing basis. I invariably smile when I think of all the possible permutations of how to classify a dogs breed, so I guess it would be a challenge for any competent statistician to break the data to something that makes sense to mere plebs like myself. Do you have some statistic info regarding death causes in search and rescue dogs? I developing a project of a canine wearable device focused in monitor dog bio-signals in a way to avoid heart strike due hard work. Thank everyone, for this wonderful information, i have a broken heart my dog of 14 years died in less than 24 hours when I noticed wheezing and a cough. I could not believe he was in Heart failure, and renal failure. How Did I of missed all those symptoms, he was always thirsty, and urinated alot, and loved to sleep since he was a baby, he required alot of sleep. I can rest now and stop crying he died Nov 1. since I read all the comments. THank All of You.